Starting December 21st 2015 sails every Tuesday from Havana and every Friday from Montego Bay, stops in Maria la Gorda, Cienfuegos, Montego Bay and Santiago de Cuba. A voyage on the Louis Cristal combines the luxury and service of an all-inclusive resort with the excitement of a cruise. The ship boasts a unique modern yacht–like design and travels at a cruising speed of 18 knots. She features all the comforts of an upscale vessel, such as spacious staterooms and suites, elegant lounges, restaurants and open promenades. You will enjoy first class food and beverages brought in especially from Canada, including fine French wines and Canadian premium brand beers. Naturally all the famous Cuban brands, such as Havana Club, are available too. Each day you will arrive at a new port and leave the ship to experience the natural and cultural wealth of the region. In the evenings, you can enjoy top-flight performances by talented Cuban entertainers. Together with our local partners, Cuba Cruise has created the most in-depth and exciting way to discover Cuba. A delicious variety of food is served on board the Louis Cristal, at the Traviata buffet and the more formal and elegant La Scala and Caruso Restaurants. Enjoy the sun and sea breeze at the Riviera pool bar, sip your favorite drink at the Romeo & Juliet Bar, or cut loose at the Metropolitan Show Lounge. Few travelers have practiced their salsa moves beneath a starlit sky reflected by endless ocean – an experience available nightly at the ship’s Stars Lounge & Disco. Other facilities include an Internet corner, two conference rooms, a photo gallery, duty free and travel value shops, a swimming pool, whirlpool bath, fitness center, beauty salon, and a spa with massage services. The fully air-conditioned vessel is equipped with stabilizers, telephone, fax, satellite telephone and carries an on-board physician. For more twin centre holidays in Cuba click Twin Centre Holidays in Cuba. Tuesday: 17.00 hrs. Departure to Maria la Gorda. Day at sea. Wednesday: 08:00 hrs. Arrival at Maria la Gorda. Day for excursions. 15:00 hrs. departure from Maria la Gorda. Thurday: 08:00 hrs. Arrival to Cienfuegos. Day for excursions. 15.00 hrs. Departure from Cienfuegos. Friday: 08:00 hrs. Arrival at Montego Bay, Jamaica. Day for excursions 20:00 hrs. departure from Montego Bay. Saturday: 08:00 hrs. Arrival to Santiago de Cuba. Day for excursions.16.00 hrs. departure from Santiago de Cuba. Monday: 09:30 hrs. arrival at Havana. End of the trip. Friday: Check in and get onboard the Louis Crystal Cruise Ship. 20:00 hrs. departure from Montego Bay. Monday: 09:30 hrs. arrival at Havana. Day for excursions Overnight. 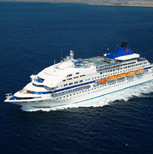 7 nights cruise ship in selected cabin on full board basis. Cuba Destino Caribe assitance. Beverages and excursions. Can be pre-booked at low prices. Port charges. Transfers to from the embarking point in Havana or Montego Bay. Visas for Cuba or Jamaica. Medical Insurance. International flights. Tips.